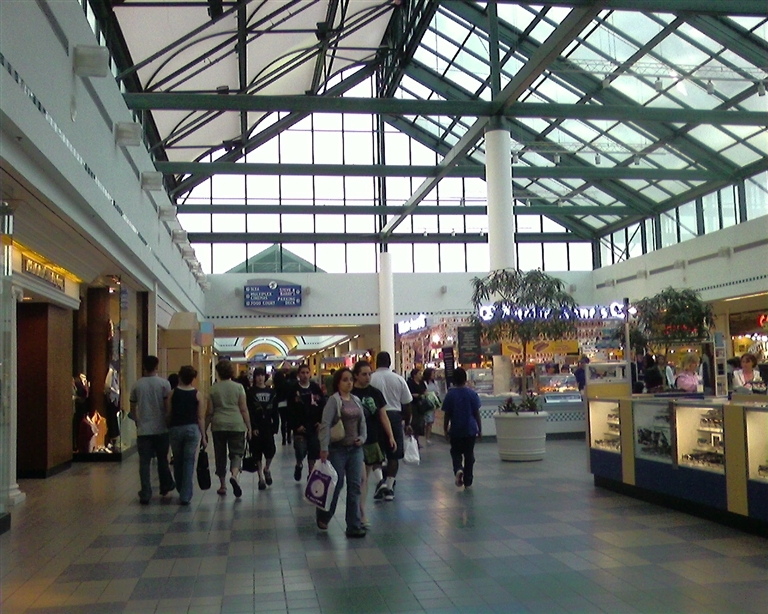 The Broadway Mall is one of the largest–and perhaps strangest–malls on Long Island. The mall opened in the 1956 on the site of a former boys’ orphanage as the open-air Mid-Island Plaza. The Hicksville area of Long Island was in the middle of a building and population boom at the time, as residents were flocking to the suburbs in great numbers. Some of the largest strictly suburban areas on the entire east coast are located in the vicinity of the center, including archetypal post-war suburbs like Levittown and Hempstead (which, with over 700,000 people, is the second most populous census-designated place in New York State). The original Mid-Island Plaza consisted of 10 buildings and 8,000 parking spaces. The center’s main anchor, Gertz, was a local store from downtown Jamaica Queens who opened a major outpost in Hicksville to follow the population trends. Gertz’ 5-story, 300,000 square foot store dominated the center’s original design, and its rumored that this store is the tallest suburban department store ever built. At some point the mall also was home to an EJ Korvette’s store. The mall was even structured with an underground tunnel (still in use today) that allowed deliveries to be made directly to the stores underneath the mall. The Mid-Island Plaza was being enclosed in 1968 (and perhaps renamed at the same time? ), then renovated again in 1989 and 1995. Gertz Department Stores parent company, Allied, united the Gertz stores under the Stern’s banner in the 1980s before becoming a Macy’s in 2001. The mall’s website offers a bit of its history. 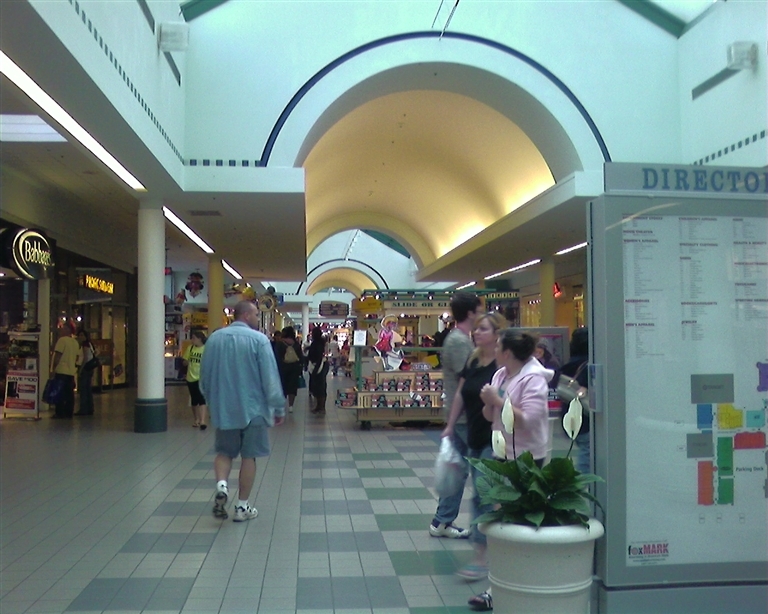 The Broadway Mall is located only a few miles from Roosevelt Field Mall, the largest mall in all of New York state and one of the largest on the entire eastern seaboard. As a result, it has an interesting feel and has an unusual store roster. The center is shaped like an “H”, with Macy’s at one of the junctions. Its other two anchors are a Target (which had been a JCPenney very briefly from 1999 to 2001 or 2002) and an IKEA, making for one of the stranger rosters of anchor stores of any mall in the northeast. 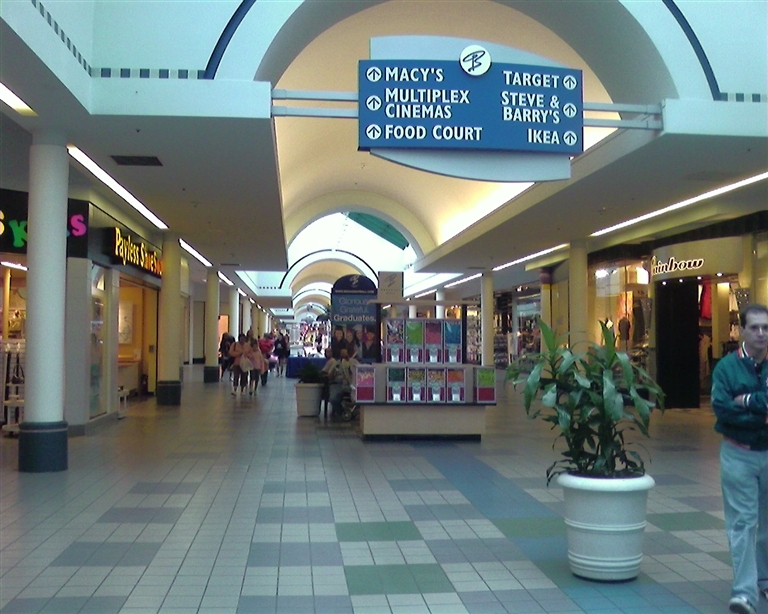 Broadway Mall also boasts Steve & Barry’s University Sportswear, H&M, Old Navy, and a movie theatre as junior anchors. I’m not entirely sure what the IKEA or Target stores were initially, but the mall did boast EJ Korvette’s as one of its original anchors. Korvette’s stores tended to have large footprints, so it’s possible that IKEA took this space after the mall’s major redevelopment in 1995. 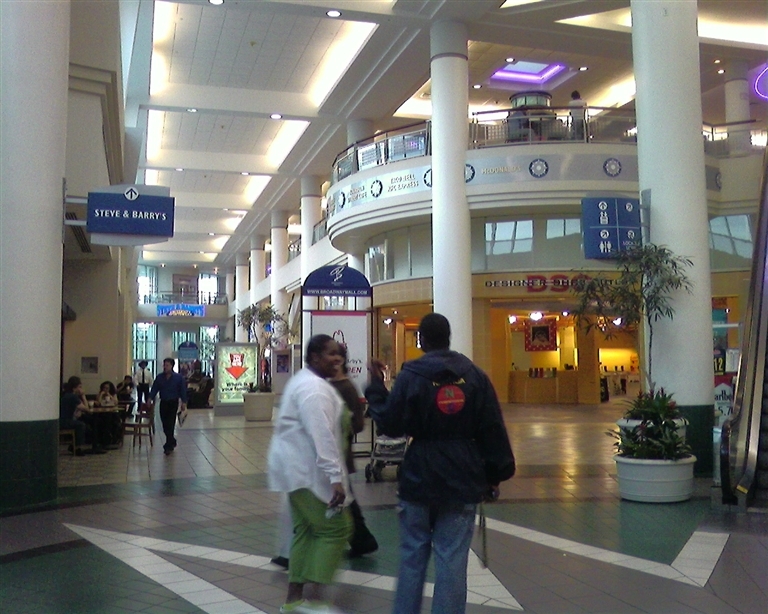 MallsofAmerica has some really cool photos of the Broadway Mall during its Mid-Island Plaza days, and our photos were all taken in May of 2007. I’ve been to this mall many times since 1999 (until 2004, this IKEA was the closest one to Boston) and it hasn’t changed much in that time, beyond when Target replaced JCPenney at the rear anchor. The imposing, humungous Macy’s store is certainly a highlight here, as is the cavernous center court and the strange way the food court is cantilevered onto a second level. But really, Broadway Mall is most interesting as an example of how a second-tier mall that would normally be crowded out by larger siblings is able to hang on with some less-than-traditional anchor stores and make out just fine. I haven’t seen pictures of this place since it was enclosed. It’s a good looking mall. Very open and airy, and IKEA having a mall entrance is very unusual. Gotta love the Macy’s, too. It’s massive. IKEA has had other stores with mall entrances, such as Potomac Mills outside of DC (later relocated to an outparcel, with the old store converted to more, smaller shops). Usually, they seem to prefer being close to, but not in malls as in Atlantic Station in Atlanta or White Marsh outside of Baltimore. BTW, Hempstead looks like it had already been flocked-to by WWII. .For many years, it had a very successful freestanding A&S in its main street-like downtown. That store went up in the early/mid-50s. The combo of original stores sounds odd now, but early shopping centers were seen as gambles and some chains still built freestanding suburban stores until well into the 50s. A low end discounter could never have gotten into a major center, but low end full-line stores (Federal’s, Wasson’s, Goldblatt’s, etc.) often were the first to go to the ‘burbs and sometimes even wound up being paired with rather upscale stores. EJ Korvette was a step above the primitive, often shoddy early discount stores and would have been acceptable as a co-anchor for a less than upscale, regional department store. It hurts to see the boring look of this place today in contrast to that vintage photo. Nothing new there. About Stern’s, I was first exposed to them as an estranged Connecticut native when my brother attended Stony Brook Univ. In the early 2000s, we made some trips to the surrounding malls but most notably SmithHaven Mall which retained its 1980’s vintage and closed Stern’s for years before they decided to axe it for a lifestyle addition and subsequent remodel (which I was caught right in the midst of in 2006). Even then, the place looked out-of-time which explains why Broadway Mall’s former husk looks the way it does. The former Stern’s here reminds me of some newage sarcophagus yet its the only hearken to earlier times. Also, a different looking, albeit mallside Target here, I’d like to further note how Target stores seem to have more flexibility with inside mall entrances than the homogenous designs they’ve unveiled in stand-alone store past waves. 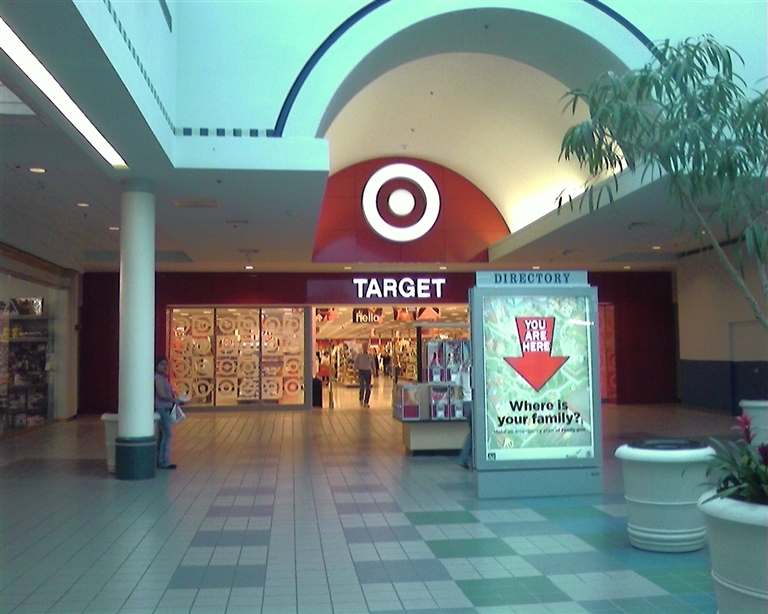 Target seems to be the more daring discounter to operate inside malls unlike its critically spotlit rival, Wal-Mart who astonished some with its own, rare inside mall accessible Wal-Mart over at the Sunrise Mall (which replaced a Stern’s) in Massapequa. Let me bring to light the question: Wal-Mart or Target? Who has more inclusive mall locations? Whatever the result, both stores who typically enter malls are set out to save their anchorage likely due to the larger malls who are killing them off around them. Don’t know why, but I’m interested by these malls out on L.I. Keep ’em coming. Was the JCPenney turned Target “new” construction to the mall? Or, did something exist in that building prior to the JCPenney? One source told me that Penney’s used to be Korvette’s, but someone else told me that Korvette’s sat empty for a LONG time before it was torn down for IKEA. In any event, Penney’s was torn down for Target. 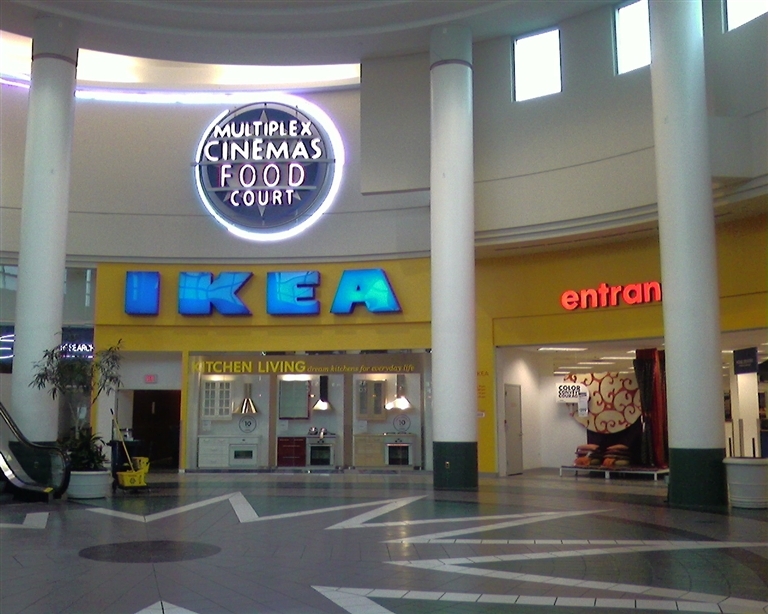 When the mall expanded in 1995 the new wing went out to IKEA’s entry. The store under the food court first was NOBODY BEATS THE WIZ a ny area electronics retailer. Then it was sam goody, now it is rosewood home. Strange though the broadway moltiplex wich is 12 years old& does not have stadium seating. Then again in Nassau County the only theatre that has statium is ua westbury 12 near Westbury music fair. As I recall from my childhood the Korvettes was originally an S Klein store. Korvettes eventually took over this location. The store stood roughly in the area where the Ikea is now, and I think it was 2 stories. The building was demolished in order to build the Ikea. I remember the mall kind of decaying in the 1970’s when newer malls like the “Sunrise Mall” were built. Eventually though they turned it around. I think the presence of Ikea and Target have really helped in that regard. Across the street from Broadway mall is a very large Sears store. It opened around 1964 and for many years was one of the largest Sears locations in the east. I think it’s still the busiest Sears on Long Island. @Pete, IKEA was originally across the street next to where Sears was. I remember when they built both of those stores. Macy’s was originally Gertz since the mall had opened. In the rear of the mall, on the right side, there used to be a Hills Supermarket. It changed hands a few times. Bohack might have been there also before Hills. JJ Newberry’s, Chandler Shoes. I do remember the underground parking lot for deliveries. Gertz was 5 stories and no windows. I remember it when it wasn’t enclosed. I remember when you could smoke in these stores.. Those silver chargaplates they used for store credit cards. I will never forget the day my mother and I went shopping after she picked me up from St Ignatius. We were in Gertz on the 3rd floor. The power went out. You want to talk about dark???? We were told to stay put as there was too much smoke in the stairwells to use them. there was a fire on the 2nd floor. We could not get out. The fire dept. put it out and we finally went down the stairs. Gertz said no more smoking in the store after that without a law being made. I remember Hicksville before they raised the tracks. IKEA never was across the street, next to Sears. It stands on property that used to be the Twin Theaters, called Twin North and Twin South. The supermarkets in the back of the mall were Pathmark on the south end and Food Fair (later merging with Pantry Pride and also Hills), on the north end. When the mall was remodeled as the Broadway Mall, Pathmark moved to Jericho (into a new mini-mall, which is now a Waldbaum’s, no longer a mall either). Incidentally, the Broadway Mall remodeling included experimenting with carpeting which proved to be a disaster, with spills and was not replaced, but removed. So Korvette’s stood empty for like 20 years? Or did Ikea open in the 1980s? It is amazing how Broadway mall remains full dispite that roosevelt field is only 7 miles west. But Sunrise mall & Green Acers mall on Sunrise Highway are nothing to write home about. Give me Roosevelt Field or give me traffic! This Mall Reminds Me of the Northwest Plaza that was posted earlier, especially the mall entrance. The corridors also remind me of the mall as well. Anyone agree with me? How many floors is that Macy’s? It’s huge. ikea opened in 1991 or 1992.
the korvette’s later became a movie theater — when korvette’s originally was in the mall, a two-screen theater (known as the ‘twin theater) was where the ikea was later located, and it later expanded into a multiplex. from what i remember, the rear korvette’s area was vacant for a long time; now, most of the former korvette’s store is actually made up of the food court/multiplex (which took over the top floor of the renovated north wing in the mid-’90s)/steve & barry’s. 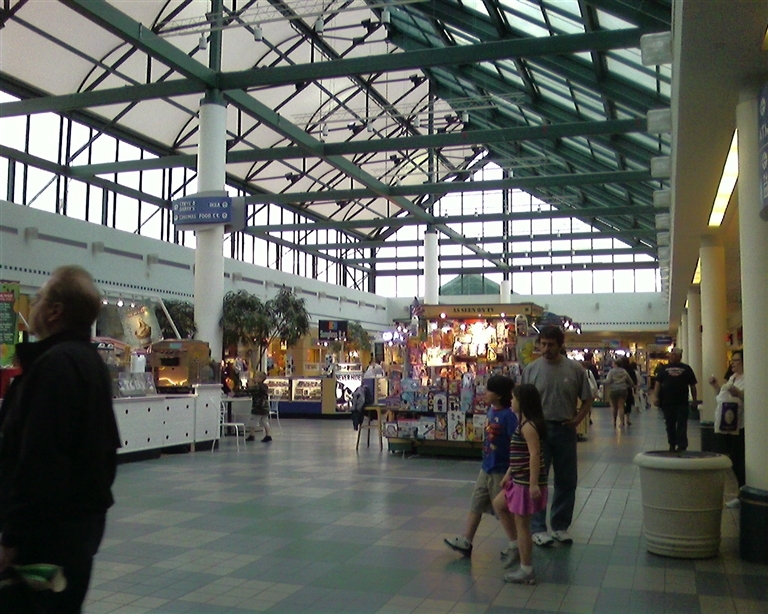 also, the food court, when it was first built, was originally located where the target is. 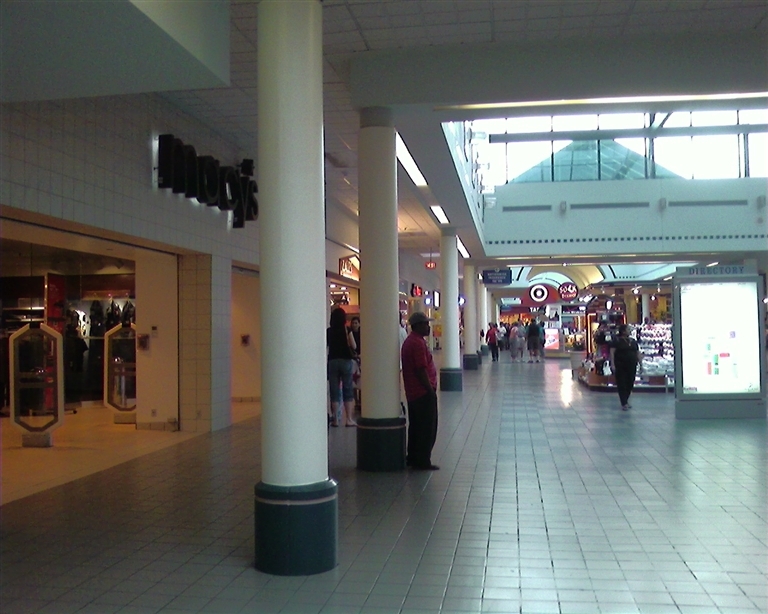 the corridor that led to the food court opened out to the parking lot until jcpenney was built. i think the only store that’s remained in the same place during my entire life (i grew up in hicksville) , aside from macy’s, is the frederick’s of hollywood located in the mall’s southwest quadrant. I’ll say one thing about broadway mall that food court is allways BUSY! Aside from that the only problem is can not expand outward do to closeness of homes that ajoin it. As i said before it is a few blocks to L I R R, As a resolt the only to keep the mall growing in the future is to deck parts of the surface lots & add on to the mall way from the residential areas. It will be easy do to the existing footprint of broadway mall, but it will have to be done long term servivial. And one last question, is this the last IKEA left in North America that’s located in a mall? (since the one at Potomoc Mills was relocated) You sure don’t see an IKEA just everyday within a mall, though it’s interesting that I read a rumor somewhere that once Mall of America/MOA(in MN) starts to undergo a new renovation and expansion within the next few years, that IKEA would become connected to the rest of MOA…. And for those who want to see plans, it’s on this website. I think it is the only mall where IKEA is attached to the mall and/or has its own mall entrance…there used to be an IKEA attached to Plymouth Meeting Mall in PA, but it recently relocated. To my knowledge, below are other malls where IKEA is located on the mall property or very close to it. 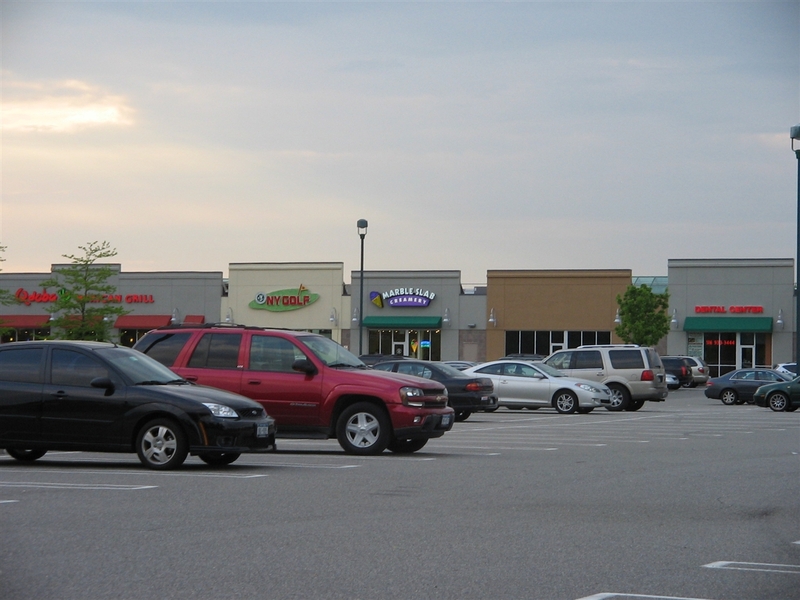 – White Marsh Mall, MD: A very successful mall in the Balitmore area off I-95. Its location off the interstate and its IKEA location keeps the mall successful, eventhough Towson Town Center and Mall in Columbia are a little more prestigious and successful. – Garden State Plaza, NJ: Recently built across Route 4 from the mall on the land of the former Alexander’s…very profitable location. – Jersey Gardens, NJ: IKEA came first (right across the Turnpike from Newark Airport) and Jersey Gardens opened a few years later right up the street. -Mall at Millenia, FL: IKEA will be opening soon right behind this very successful Orlando Mall. to talk to you about the mall. I saw your posting and it brought back a lot of memories. My family was from LI and alought I grew up in Queens, spent most of my time there. I remember visiting Sears and the mall from about 1964. We took the train out that time and the tracks were at ground level. My parents shopped in that supermarket to while I bought records in a store there. How times change. I used to go to the movie theater in the 70’s as a friend of mine was the night manager. Do you remeber the old Raceway Cinema? Good to talk about the Good old Days even as I become one of them! Mallguy, I actually visited Mall of Millenia in 2003. Traffic will be HORRIBLE if an Ikea opens. In the 70’s, where target is now, used to be 2 food stores across from each other. One , I think was Pathmark, One was a hills supermarket, they sat vacant for a long time. Where the food court is now but on the first floor sat Mid Island Twin Movie Theater, and the Department of Motor Vehicle was somewhere on the outside. The Old Navy Store was Bonds Mens Clothes. Sitting inside the Mall in front of Gertz was a trailer or just a retangular box which housed one of the best cookie bakers, Rachels Cookies. They used to go to each store every morning for coffee and muffin orders. Also in the eighties I sat in on many Mall meetings at Mid Island Plaza. The Mall anchors sat vacant for a long time. Mainly because Gertz had a 52% controlling interest in the board. Everytime a vote came up to approve Macy’s as a tennant, it would be voted down by Gertz. I grew up in Plainview in the 70’s and rembember taking the N78/79 bus to go to direct to “Mid Island Plaza” (now Broadway Mall) many times. It seemed more exiting then than it is now, even though I now live in the UK and only visit about twice a year. Believe it or not, in the 1970’s there was a plane that was parked in the parking lot outside what is now IKEA, that sold stereos. I remember climbing up the stairs to go in. Does anyone remember that? I think the reason why the new owners took away the bus stops, was that they wanted to attract customers who were rich enough to own cars and discourage people from just hanging out and not making any major purchases. Shame. Yes. It was called “Fly By Night Audio.” I think it was a DC-3. Kinda like a long, cramped, narrow closet with not-so-hot prices. And regarding getting rid of the bus stops to discourage people who weren’t rich enough to own cars, they got that idea from Roosevelt Field. Can’t trust those Simon malls. Mark my words, they’ll be throwing the buses out of Walt Whitman and Smithaven Malls one of these days! Mid Island Plaza/Broadway Mall was actually the first of the malls to discontinue direct bus service (although in their defense, the buses stop about four blocks away at a major LIRR station. To the best of my knowledge, Walt Whitman, Sunrise, Smithaven, (and I think Green Acres) still have bus service SOMEWHERE on their property (although it could be someplace really inconvenient. I don’t know if South Shore Mall ever had bus service, or if it still does. @Bruce Levy, Here is a picture of “Fly By Nite Audio” with the handwritten date on the back – October 1975. That is either the date of the photo or the date the photo was developed. You can see U.S. Gerenal tools and Nathan’s in the background! I remember going to the ” Mid Island Plaza” way back in the 60″s with my family, and I distinctly remember a small snack bar in the lower level of Gertz that served the absolute most delicious frozen vanilla custard with either chocolate or strawberry syrup in a tall parfait glass! I Also remember a small clothing store in the center section of the mall having a fire which was followed by a fire sale where I purchased a smoked stenched multicolored satinish waist jacket for pennies on the dollar……Hey Man!..It was the 70″s!..Does anyone remember the custard or the fire? @steve, yes, do you remember when Goodyear burned down across from St. Ignatius? They tore down that entire side of the street. I remember when they raised the tracks. I remember those escalator stairs to the top floor of Gertz. They were narrow. The elevators that didn’t work. Hand M is where the supermarkets were. The Ikea location wasn’t there in the 50’s. Either was the second floor or the roof. @steve, yes, yes, yes. I had a dream last night about Gertz and those frozen parfaits! That’s why I had to do some research on Gertz department store and find out if anyone remembered these desserts. I remember going to Gertz with my Mom and at the end of our shopping she would take me to the snack bar and I would have to decide whether I wanted the chocolate or strawberry delight. It always was a difficult choice. I remember the glasses were very narrow at the bottom and the long spoon never could reach the bottom where all the good stuff melted. It was very frustrating as a kid and I was always tempted to turn the glass over and pour it into the spoon. What do you think the parfaits where made from? I haven’t tasted anything close to them since, not Carvel, Mr. Frosty, Dairy Queen. What a fond memory. Thank you for writing about your experience. Does anyone remember the name of the ice cream/custard treat from Gertz? A group of us were talking about taking the bus to the mall and of course stopping a Gertz for the dessert however, know of us could remember what it was called. @Pat, Those wonderful ice cream treats at the Gertz snack bar were called “WALK AWAY SUNDAES.” My HS boyfriend and I worked at the Long Island Room Restaurant in the Gertz basement around 1972-73. Often he worked the snack bar on the main floor (at the back entrance that was near the annex) where the sundaes were served. We used to joke about the name for the sundaes since they were served in tall thin (real glass) glasses and metal spoons were used to put the syrup in the ice cream (with a twisting motion which made a parfait look). There was a rule that the customers were NOT to WALK AWAY with the glasses and spoons! @Mary, we all remember the ice cream treat which was sold at Gertz, could it have been called “malt” ? It didn’t taste like malted, and it wasn’t a drink, we know that it was vanilla ice cream with either chocolate syrup or strawberry. And if you are intersted, Supreme Pizza on stuart ave garden city, nephew of pizza maker from D’Amore from mid island plaza pizza, had it today tastes just like it did back then. Its located next to tin alley restaurant bar, in the strip mall. @Ang, I loved that Pizza! I used to work at Mays Dept. store in Levittown, and every Friday a bunch of us girls would go to that pizza place..It was so good and to this day I havent had pizza that good. Pizza Supreme, the little rectangle pizza (they call it square) with the one big slice of cheese. They used to be in the Roosevelt Field Mall in the 70’s and early 80’s, across from an Alexanders Department store and near a video game hangout called Timeout. Pizza Supreme’s square pizza is so good, I was estatic when they resurfaced in Garden City behind the Mall. They’ve got a painting on the wall of the old place. I really wish I knew who the Owners and operators were for the MY PIE pan pizza in the Broadway Mall. My PIe was dark, candle lit with a wall full of colored bottles. I loved that place, the pizza was out of this world. I don’t know why they didn’t succeed, it’s a shame because they would have thrived today. The Ikea and Target as anchors really brought that mall back to life. If My Pie ever resurfaces, someone please post where we can find them. I wish i had the name of the owners so I could track them down somehow and convince them to go back into the pan pizza business. @Mary, Sorry to see it’s been so long since anyone posted on this site as I’ve been in search of the Holy Grail of ice cream oriented treats since my teens when I discovered what my brother and I labeled “Gwapal” because it tasted like a combination of Soft serve ice cream, Gelato and actual custard! It was labeled French Custard as I recall and it was a long teaspoon full of chocolate or cherry I am pretty sure as I have a toxic memory for such things. I’m also writing a book about growing up on the North Shore of Long Island (The pretty side on the other side of Northern Boulevard) as for all this talk about Target and Ikea I could care less I lived near the biggest mall in America for 14 years the Mall Of America or as I call the sprawl of America; I will have to check out that pizza place as the machines that made it came from Europe I have been told. @Jeff G., People are confusing the Roosevelt Field mall with the Gertz mall in Hicksville! I worked at the Gertz store for several Christmas’s when I was in college and I definitely was not at Roosevelt field. The snack stand was located inside the Gertz store in Hicksville and no where else that I know of. @Pat, I remember that ice cream it was the best I ever had, and to this day I have been trying to recreate that taste. I am truly amazed someone else actually remembers this..
@Alan, I feel exactly the same..I wish i could go back, sit on one of those stools and eat my vailla ice cream with chocolate syrup on top. The best taste…. @susan kunnemeyer, It wasn’t on top Susan they dipped the long teaspoon with the chocolate or cherry syrup all the way down into the French Custard! @steve, Thank God someone remembers that ice cream besides me .It was the most delicious thing in the world and nothing is like it that I know of. My cousin and I have been talking about this!! I remember my mother (who was raised downtown Brooklyn) used to tell us about “the drink you eat with a spoon” she’d get at A & S and “frozen custard” from a place on Court St. When I asked my cousin if she remembered it – she brought up the ice cream at Gertz. We don’t know if they’re the same thing. That and ‘mallow or mellow rolls”. @sally, I totally agree, its so good to know others remember this..
@steve, WOW I sure do remember the ice cream. were still warm and the ice cream would melt. big star, my father always told me that was MY star. ring. I sure did LOVE that! @Denise Andrus, Hi Denise, Oh that custard! I dream about that stuff. I used to get it at the 5 & 10 in Jamaica. I have been hunting around the web trying to find the recipe, that’s how I found this post. @Denise Andrus, I remember all of those things..I am truly amazed that others had the same memories as me, how great is that..
@steve, I remember the custard. In fact, I found this page because I’m still looking for a recipe for it. I’ve never tasted anything like it since. I lived in Hicksville from 1953-1963. My parents moved to Maryland while I was in 10th grade at HHS. Macy’s is a 5 story building. If you go up to the 4th floor of the current store, you’ll see a set of very narrow blocked off escalators that go up to the 5th floor. There was also a Gertz furniture store next to the main building that I believe has since been torn down. @formerny, Gertz did have a nother building which they used for furniture and seasonal items. Pools, grills etc. It was on the south side right next to Gertz. I do remember the custard. we would play hide and go seek in the store. Does anyone remember the pizza place with the metal trays. A slice pizza and soda was .25 !!! @Denise Andrus, The Pizza place was the Hurdy Gurdy, it was near the Game Room. @Deb, I recall the Hurdy Gurdy. My mom remembers the proprietor hitting on her, even though I was in tow. YES I DO REMEMBER THOSE FROZEN CUSTARDS WITH EITHER THE CHOCOLATE OR STRAWBERRY FLAVORS, MAN THEY WERE THE BEST. I LIVED IN THE GARDEN APARTMENTS ON RICHARD AVE A STONES THROW FROM THE MALL. I ALSO REMEMBER (1963)THERE WAS A SMALL LITTLE AMUSEMENT PARK WITH A CAROUSEL. ON THE PROMENADE THEY SOLD THE BEST HOT SALTED PRETZELS FOR A .25 AND THERE WAS A FLAGG BROTHERS SHOE STORE, AND ON THE BOTTOM FLOOR THERE WAS A SLOT CAR TRACK. AHH THE GOOD OLD DAYS>>>>>>>>>>>. Wow ! Gertz must have been something ! I know Stern’s was ! I have never been to a Gertz or Stern’s that still had a restaurant on the island.Now everything is a Macy’s.Tell me, in addition to the snack bar on the lower level of Gertz, did Gertz and/or Stern’s ever have a formal restaurant on one of the upper levels ? Interesting about it being so tall. I remember Stern’s post 1950’s flagship (post NYC) had a restaurant that my family and I enjoyed for over 25 years at the Bergen Mall in Paramus. Incidentally, that store was four floors tall and there were windows all along the top so you could look out onto route 4 while dining in the full service restaurant. It was wonderful ! Thank you. @RJ, Oh my, I think A&S did in Hempstead have a restaurant. Glad to see that the best frozen custard that ever appeared on this planet is not forgotten. It was always tough to choose between having the chocolate syrup or the strawberry syrup be put on that long spoon before it was plunged into the custard. And all for a dime! Over the years I’ve met many a person who has fondly remembered this amazing dessert and who has searched in vain for its rival ever since. If anyone’s got a suggestion, please do post it. Doubtless that hundreds will be in your debt! PS That great pizza place (terrific Sicilian!) in those days (referred to in an earlier post) was Pizza D’Amor. Ah yes Mid Island Plaza. -Buses stopped going there as mall did not want the Mall Rats. -Korvettes/S Klein was in back where movie theaters are now. -Ikea was built in parking lot and where Twin movie theaters were. The ice cream dessert you are talking about was in J J Newsberry’s, which was just across from Gertz. It’s funny that you mention this, because I talked about it in my family history stories that i’m working on. @Jerry, Gertz had a custard bar and a small restaurant, It was 5 stories, where Macy’s is now. The top floor was offices. Oh. of days gone by. Sid’s Pants had a store that had a sign on the door that said “Sid’s Pants…now open” and we all thought that was the funniest. Also bought my first bell bottoms from there for a whopping six dollars. I have been searching for years for people that remember that custard from Gertz…it never had a name we would just say we wanted chocolate, strawberry or plain. Someone, some where must know what they were and what they were called. I recall a musical event that took place on the north side of Nathan’s in the parking lot of the mall. A lineup of bands played all night into the next morning. We had a blast because it was an unusual thing to have in the lot of a mall and we just stay up all night and partied. I still don’t know why it was held, a benefit or whatever, but Nathan’s sure made out!..The only band name I remember was “Liquid Smoke”…I thought it was a cool name for a band. I don’t even know if they were any good! Was the chocolate syrup in the vanilla custard at Gertz called a “Black & White”? @Doug K, No, a brown bonnet. A black and white was an chocolate soda with vanilla ice cream. So many things I can remember about Mid Island Plaza. I grew up in Hicksville through the 70’s/80’s. I remember going to Pathmark and seeing the first Star Wars in the huge twin theater. Does anyone remember Wuvs? it was a small restaurant adjacent to the theater- you’d walk out the door where Korvettes used to be, and there it was. I think it closed right around the time the twin theater became a multiplex. I also remember going to Bagel Nosh, which was a stand alone store in the parking lot on the far NE side (right off of 106/107). Does anyone remember going to the Big Apple Circus that was there- I think that was sometime in the mid-late 70s. As I got older, my brother worked at Kinney shoes, and I can remember the stories he told about eating at the Hurdy Gurdy for breakfast and how nasty it was- or how about the game room…. I can remember bringing dates to MyPie- that pizza place by the bus circle and getting my hair cut at the Rage (all the hot girls from HHS went there). Then there was Merry Go Round- probably one of my favorite stores in there during the 80’s- people who went there a lot probably remember Kevin- the black guy that seemed to work there all the time. O well- those days are gone. wuv’s had the best onion rings ever! @maura, I worked at Consumers and the best part of the break was hitting WUVS…it had great burgers but the fixins’ bar was awesome. Great Fries…and Rings…but the burgers were memorable!!!! I remember the frozen custard with the chocolate sauce. It was the best.And I remember the pizza parlor where they had the booths and you could buy aquare pizza slices that were the best. There was also a pizza parlor otside the mall called My Pie and they had deep dish pizza that was really good. 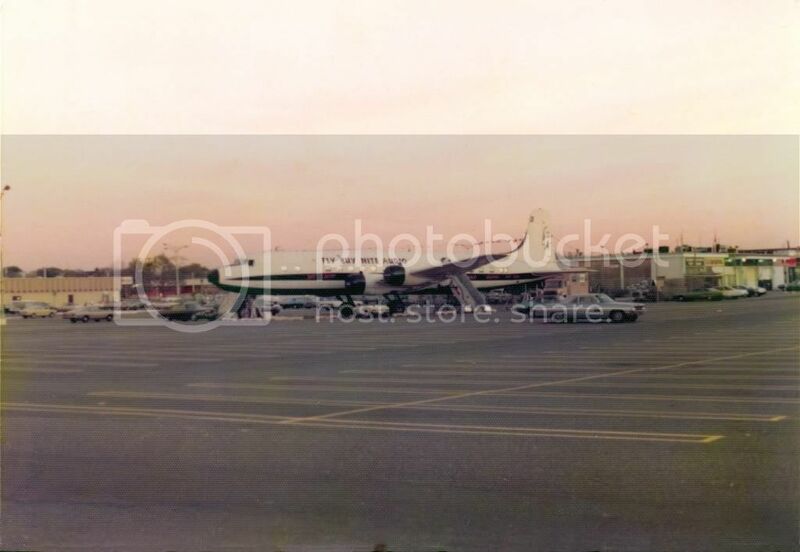 I remember the airplane outside the mall.that sold the sterio equipment. Great memories. Oh my God that custard was THE BEST EVER! I was 5 years old and I remember that creaminess and that chocolate syrup with the long spoon plunged into it. Heaven! And how about the merry-go-round with the brass ring I was unfortunately too little to ever grab one! And getting your golden book from Santa at holiday time. Great childhood memories! Hey, I worked at the Consumers Distributing for years! I remember working in the stock room down stairs,,,it was massive. Originally bright Orange and Blue, they revamped the color scheme in 1982 to grey and navy. It was located on the north end of the mall next what is now IKEA. As a student growing up in Hicksville…I loved hanging at either My Pie (which was really the mathematical symbol) and/or Ground Round which always had popcorn covered floors. Was there ever an Alexanders Department store locared near the mall? This is a geat way of remebering my youth! the restaurant on the east end was called the brown com and made chocolate egg creams, it was between the rear enterance of learner shops and the horne and hardart store. The Air plane was the “Fly By Night Audio store” the store lasted a few months but the plane was there for years after untill they cut it up for scrap and hauled it away. They may have referred to it as “Malt”, but that was no malt!..It was much more similar to ice cream because it was a creamy solid….And it was better than any ice ceam I have ever had, before or since. I grew up in Hicksville and as a teen took the bus to the Plaza to hang out on weekends. Those were the good old days. I remember the custards with the chocolate syrup being called a brown cow. They were so good I don’t even remember them having strawberry and yes the pizza was he best. It was so good it seemed like you always had to wait for a slice because it was so busy. As kids we used to take the bus to Mid Island. I haven’e been there in years, but I was there a lot. Gertz: I remember the snack bar, it was at the west entrance on the main floor. I remeber then dessert as like a soft serve ice cream, of course I could be wrong but know chocolate was the one I went for. To the left of the south entrance (as you entered) there was a wide staircase that led to the lower level Bargain basement. There were 3 automatic elevators mid-way on the west wall beyond the snack bar. Full size escalators were used from basement through 4, a narrow escalator led to 5 (and the toy department, I remember that clearly). Furniture was on 4, I believe, There was an entrance at the NW corner that was diaganolly across from Newberry’s, (which had a larger snack bar) a second entrance centered on the West wall. In Gertz, between these 2 entrances on main was cosmetics. I remember my Mom sold “Charlie” fragrance there, that damn jingle played over and over on a continuos loop tape machine. Made everyone insane. Mom wisely moved to Men’s, the south side of main. I believe there was a portrait studio on main near the east entrance. As I recall, there was also a large ladies lounge on the west side of 2, but am not positive. In the 70’s there was a grid type system in Young Mens with stairs that created an upper level shopping on the main floor. Pretty snazzy. I bought my first leasure suit in Gertz, I still have it. Isn’t that frightening. The Gertz furniture building was built much after the main building, and as I recall it was originally was outdoor (patio) furniture. I belive it said “Gertz Outdoor” on the building at some point. As for the rest of the mall, of course “Pizza D’Amour” was the best. My shoes came from the “Buster Brown” store, my suits from “Bond.” I always found it interesting that there was huge “Sears” across Broadway, but Roosevelt Field simply had a “Sears” catalog store located down from “JC Penny’s” past “World Imports.” Let’s not get into Roosevelt Field, I worked at “Gimbels” there for a number of years. Fun times. No One mentioned the STAR! there was a huge St. Louis style arch on the Broadway side,, suspended from the center was a multi faceted star made from the same material as the fiberglass panels. It was taken down when the roof was installed in 1968, the two side supports and star laid on the ground for a long time after. Thanks for all your comments. Great fun. I remember seeing Leonard Nimoy who beamed down to Korvettes about 1975? (I was 11 years old at the time), as I was a big Star Trek fan then. Of course, he was helping to sell Star Trek toys in their toy department. Lotsa people; the line seemed to go on forever and I waited for over an hour.When I finally met him, he shook my hand and said “hello!” It lasted about two seconds, but it was a memory of a lifetime. I left with a Mr Scott doll that my parents bought me along with a walkie talkie communicator set. Have any other celebrities visited Mid Island Plaza/Broadway Mall? I think President Nixon paid a visit in the late 1950’s. @Bruce, Found you post about Leonard Nimoy at Korvettes and it brought back a great memory. I too was there waiting to see him. I got to shake his hand, say hello and he even patted me on the head. Left with an autographed photo, long gone now. Thanks for sharing that memory. Mid Island Plaza made alot of memories. @Matt, No F’n Way..! My mom asked me Last night if I still had my Leonard Nimoy autographed Photo from Korvettes, then Tonight on FaceBook a friend posted a Picture of “SPOCK Meeting Jimi Hendrix”… It Inspired me to GOOGLE… “Leonard Nimoy appearance at Korvettes NY 1970’s”….. and here we are !!! but might’ve been 1975, can’t quite peg it anymore. or misplaced it, sadly, in the decades since. and my Dad’s, etc. It was totally a rush! who just passed on this past Friday. 80s–I worked at B. Dalton Books which…. street and club clothing, sort of. Record World were also amazing! Mall still there, but not the same, alas. first Dungeons & Dragons (Basic) set at!! idea what was inside that box, precisely. It was rules, dice, and not much else. @Freddie Films, Hi Freddie. Just found this post again after almost 4 1/2 years. And read your reply. Was doing some research on old LI places and landmarks and gravitated back to this site. Sorry I did not reply earlier. Yes, now that Mr. Spock has died, these memories become all the more bitter sweet. I can remember looking up at Leonard and thinking how tall he was. I must have been 9 or 10, but a very big Star Trek fan. I wish I had that photo now. Another victim of time. I remember building models of the communicator, tricorder, and phaser. Coolest models. And of the Enterprise and the Klingon Battle Cruiser. I also think I did the Shuttle Craft. I was a big model builder back then. Wow, some really great memories. Reading all these posts about Mid Island Plaza it’s really easy to get lost in time. Read one post about a guy commenting that it was really nice to remember the good old days as he becomes one. I know what he means. Thanks for your reply. It brought back a lot of great memories. I had forgotten about the models of the Star Trek items. They were treasures! Thanks again. I remember going to the Mid-Island Plaza shopping Center with my mother growing up in Westbury in the 60’s. We always stopped at the snack bar and had some of the most delicious ice cream with either chocolate or strawberry syrup. It was the best. I recently had some Breyers vanilla ice cream that had softened and that taste reminded me of that ice cream from Gertz’s snack bar! What a wonderful memory! I even called my younger sister and she remembered the ice cream, too. “Tricky Dicky” Nixon delivered a speech at Mid Island Plaza on September 28 1960 during the Presidential Campaign. Does anyone knows exactly when the Ikea store opened there? 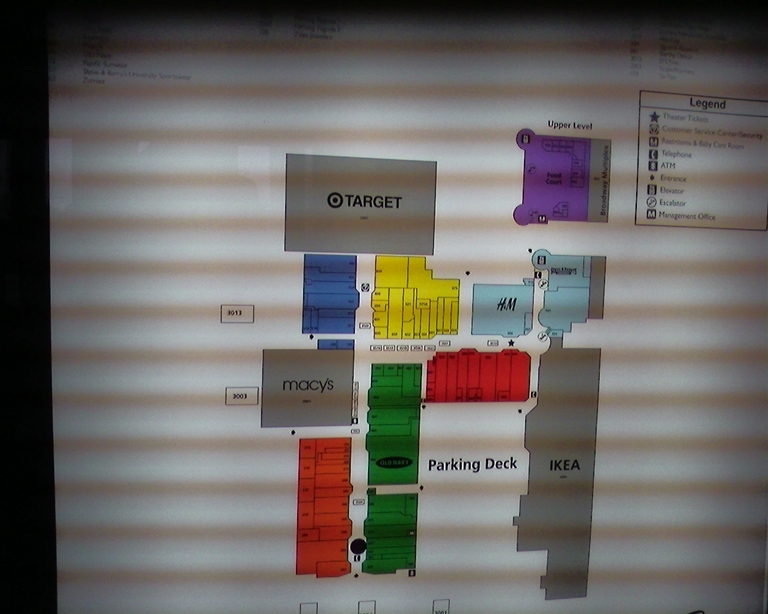 I recently (December, 2008) visited the Macy’s store that was once Gertz. There is a lot of stuff still visible from the store I remember in the 60’sand 70’s. The staircase I mentioned in my previous comment is still there, it is not visible to customers on the main floor, but you can access it in the basement. The escalators are the same, with the distinctive blue fronts. The overhead sign fixtures are there. The elevators are also the originals. Its funny, I remember the sounds they make, very mechanical copmpared to the very quiet ones today. There is a distinct clunk at a certain part of the travel, probably the counter weight passing. The call buttons are small, black push buttons type, and match the ones in the car. The floor indicators are the original type, as well as the handrail. The interiors have been painted. Furniture is on 4, same as Gertz had, and you can see more what the Gertz layout looked like. The columns, some mirrored, the round ceiling ventilation ducts and flourescent fixtures, all unchanged. Someone mentioned the escalator to 5 is closed, true, hidden behind a door marked employees only. Of course the entrances on main are the same, but the west entrance is permanently closed. The Buster Brown store is now a Nationwide Insurance office, how dull. Most everything else of course is changed, but it was fun to see what was still there. I remember the airplane, it was originally called flight 107 and was a restaurant for a while. Also, us general hardware was a free standing building just to its rear. all lessons stopped as teachers and kids pressed against the windows to watch a full sized plane brought in on flatbead trucks driven accross the parking lot. After school – the boys couldnt help but walk over to see it – one trailer had the body of the plane and another trailer carried the two wings – over the next few weeks we watched ot being assembled in the parking lot behind Korvettes (where IKEA is now). It opened as a high end stereo store and you walked up the gangplank in the front to enter and you exited the rear fuselage door – how cool was that – I think it changed names to “Alarmingly Safe & Sound” and sold security systems+steroes before it closed. I think the plane was a DC-7 model. If anybody has photos – please post them. Also – does anybody remember the head shop at Mid-Island ? Ah yes, “Sunflower!” Never understood why my mom never liked going anywhere NEAR the place, but then, I was a kid…what did I know about head shops? Nobody’s talked about Newberry’s! I was very young when it was around in the 70s but I thought it was sooo cool because it had two kitty corner entrances. You walked in where Auntie Anne’s pretzels is now and walked out by where Fredericks is now (approximately). So, you walked in from one “street” and walked out to the other “street”. I don’t know why but that fascinated me. Newberrys was a five and dime. I remember buying “notions” there (sewing stuff) and “bloomers” for my grandmother. @Michelle, Loved Newberrys. They had a great notions dept. I loved the basement of that store. I think they were where the Old Navy store is now. I remember when my best friend walked into and through one of the doors of the Chandler store. Before they required the cross bars and safety glass. @Anne, regarding where Newberry’s was, Michelle was correct. The store that you’re thinking of is Kresge’s. A true 5&10, it made Newberry’s look upscale. I remember playing on the pinball machine in the back. I remember the west wing had a liquor store and a magic shop. The north wing had a women’s clothing store shaped like a river steamboat and was called “showboat”. The mall was managed by Franklin Frank and his son Kenny assisted him. I believe that the original Petland was there and they kept their tropical fish stock in the basement for the mall location as well as other branch stores on Long Island. Thanks for the memories! I had forgotten about that airplane/stereo store. One of the outparcel restaurants was a Ground Round, where my wife and I went on our first date. And we’re still together 27 years later. @Mike, I see a much different Hicksville than you all do. I remember when they built Division Ave and the library by the old high school on Jerulsalem. I grew up off 5th Ave and Brooks Street. We grew up in jericho and the Gertz parfait was always the highlight of going to the mall. It is one of those memories that I have to wonder if it could have been as good as I seem remember it being – but judging from these posts it must have been! The other must was Pizza D’amore. The most original and delicious pizza around. Thin crusted sicilian rectangles with a rectangle of cheese centered on each slice. Crispy, bubbly, and hot. I always seemed to burn the roof of my mouth on the first bite because I couldn’t wait! They were not too big;my brother and I would eat 5 slices each. I have been hunting for its equivalent for years and have found some close, but not quite as good. If anyone knows of anything close, please post it here. Rizzo’s in Astoria is excellent and will remind you of it, but not a 100 % match. @mike, There was a pizza place in roosevelt field called pizza supreme which was just like Pizza D’Amore. Pizza Supreme still exists it is on Stewart Avenue, in a shopping center behind Roosevelt Field. It is the same Pizza. I go at least once a month. Brings back memories. The closest thing to those parfaits is soft Breyers with Midnight Moo (tastes like the syrup at Gertz) Midnight Moo can be purchased at Trader Joes. I have read all of the above posts and I am going to mention 2 things that NO ONE else has talked about. FIRST I remember in 1960 when my father took me to the mall to see Yogi Berra, Whitey Ford and Mickey Mantle. My dad put me on his shoulders and we were only about 30 feet from the podium they were on. Any one remember the slot cars down stairs? I do, went there often ! Bt the way, I have figured out how to make those fabulous Ice Cream Malts from Gertz their…………….GREAT !!!! @Richard, Ok so give….the RECIPE!!!! @Jim, So where is the recipe? Did you ever get a reply from Richard? I grew up in Hicksville in the 60’s, so the Mid Island Plaza was a part of my life. @Peggy, Has anyone gotten the recipe? Surprised that nobody mentions the large Chinese restaurant, Longs, that operated in the western part of the mall for years. It was popular for take-out, and I remember well having to walk into the kitchen to pick up the order, which always came in a brown paper bag with the menue and bill stapled at the top. Netx to that shop was a bakery that always smelled great, but I am afraid that the taste didn’t match the smells. And, one of the grocery stores was known as Shop-Rite, even before it was Pathmark, Foodtown or later Mel’s. Don’t forget the S.H. Kress and the Kresges stores, as well as Frankels and Franklin Simon. Lastly, I will bet nobody remembers this. Just before the mall was built in the 50s, the Ringling Bros. circus made a stop on the site for several shows. The elephants and entire show unloaded at the Hicksville train station and moves over to the open site. No kidding. @Richard, I remember all the same stores…what about Newberry’s diagonally across from Macy? I also remember the very good malted Getz used to sell in the western side of the store on the main floor. You could get strawberry or choc syrup and all for 15 cents! Lastly I remember the Pizza place down by Long’s Chinese and they sold square pizza on metal trays which we used to use to sleigh ride. Does anyone remember when they handed out tokens for prizes for the mall? I grew up in this mall. Some of my ear;iest memories are inside that old Korvettes.I ;oved that store. I remember it being empty until they gutted it for the movie theter/food court. I actually got in there when I was about 10 years old in 1985. We had some Cub Scout function outside the mall entrance to the store. They opened the fogged up sliding doors to the store a liitle bit so we could store supplies. I took the opprtunity to explore as some of the lights were on inside the store. The place looked like it was stopped in time! I felt like I was back in the ’70’s looking at the old color scheme/signs/mannequins-remember the old disco floor on the first floor by the escalators-it was still there! The place stood empty for another ten years. I miss WUVS. waiting on line @ Consumers for your purchase to come out. Frankels was next to Korvettes. Newberry;s was 2 floors w/a Coffee shop. Bonds Clothes. Rachel’s cookies that looked like a boat. The old Gertz store still shows through in MACY’S. Remember when the building was white? Gertz & Stern’s had the resteraunt up until Macy’s took over in the basement-the stairs are now a fire exit. The old Ground Round out on the street was the besr as a kid. The old theater w/the brick wall divider betwwen the hallway seats. This was when each mall had its own personality. now in 2010 that mall is empty, Steve Barry which was under the food court is gone, starbucks was on cornor gone, b dalton is gone G&G is gone, lane bryant gone, Anex is gone, gap is gone, and the list gones on..
@a.coper, tuesday morning is gone, max rave is gone, marble slab creamery is gone, one of the jewelry stores is gone, one of the restaurants went away. the mall just looks temporary in a lot of places. in 2 cute, you can still see the suncoast movie company logo on the ground, the sam goody logo is still visible outside the designer shoe outlet. this mall is sadly falling apart. i still have no idea why there is a hollister in this mall. it is so out of place. Does anyone remember Delores the security guard? @Sandra, Was that the mean butchie woman? I moved to Hicksville (Ohio St) in 1952 and watched Mid Island Plaza go up. We left hicksvill for Indiana in 1964, so we also watced it’s first transformation from an “open air ” mall to a closed one. At the present time I am freinds with a number of Simon (potential new owners) family and employees. These pictures and comments bring back very fond memories to this old man. I moved to Hicksville (Ohio St) in 1953 and watched Mid Island Plaza go up.We left Hicksville in 1964, so we also watched at’s first transformation from an “open aie” mall to an entirely closed one. At the present time am freinds with a number of Simon(potential new owners) family and employees. Thes pictures bring back very fond memories to this old man. I grew up at this mall too..even worked at Record World for a few years. When I was a kid however my greatest memory was seeing John Travolta at Korvettes. He had just put out an album and was going to do a record signing. The crowd was too large so they rushed him off to the roof and the crowd gathered in the lot and he did the Barbarino dance from the room top. I remember this so clearly because it was the same day that I was making my communion and wore my communion dress to the occasion…boy do I miss the Plaza!! I discovered the mall in 1982, after I was all grown up. It was still called Mid-Island then. I made the scene too late for those wonderful-sounding frozen custard treats, but now I want one. I didn’t go very often, because it was a long drive. But it was worth it now and then to go to My Pie, the only deep-dish pizza on Long Island. It later became Gourmet Pizza and Things, then a gift shop, and now it’s Panera Bread. 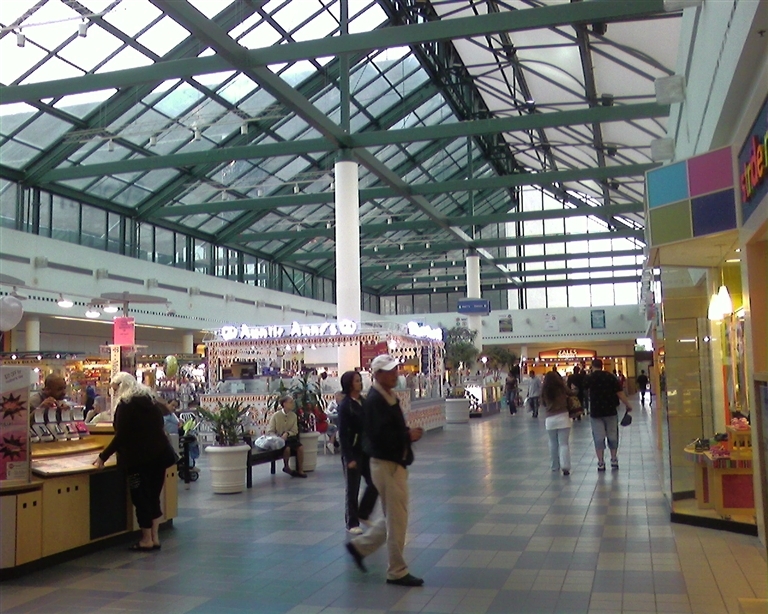 Mid-Island was the only mall on Long Island with two major bookstores, Waldenbooks and B Dalton. I could spend hours there. Now they’re both gone. I remember being in one of the bookstores one day in ’83, and a cute girl came over and tried to start a conversation. I got tongue-tied and couldn’t think of anything to say, and walked away. Oh, when I was young and stupid. I worked at the Mid Island shopping center in 1973 at the S J Kleins department store as an 18 year old Security Guard, standing at the doorways, watching for shoplifters. I also knew a guy at the B Dalton bookstore named Steve, a real nice guy. When you are young — and even later — you just don’t realize the precious things of life. Gertz was also there and 2years earlier, at the age of 16, my brother (18) showed me a book called the Primal Scream, the Cure for Neurosis. It became our bible as we had had a very rough childhood and felt we needed emotional help and we decided that we would seek this therapy out. John Lennon and Yoko Ono went to Primal Therapy as well as James Earl Jones. Oh yeah, it was S Klein where I worked, not S J Klein. Mid Island Plaza Shopping Center is how we called it. I used to go to Agway and buy gardening supplies. As a kid, gardening was my hobby. I used to pick up peat pots and seed starter mix. We spent many days at Mid Island. We lived in Levittown and it took us about 15 minutes to get there. What memories. This shopping center was one of the few happy places of my childhood. Yes, I remember the pizza place in the center of the mall. Thanks for reminding me. to think they were only 10 cents when I was a kid . I am 66 years old. Does anyone remember the store in Mid-Island Plaza that carried the Romper Room Section I think it was Gertz . I believe it was in the basement at Gertz. I would bring my little sister there by bus from Carman Ave. in Westbury. Life was so much safer for kids then. haven’t had anything quite like it since! It has made me so nostalgic to read these comments! I used to go to the mall with my mother in the early 60s (when I attended Split Rock Elementary School in Syosset) and have NEVER forgotten the wonderful Sicilian pizza. Pizza d’Amore, wow! Yesterday or the day before there was a little segment in Newsday (It happened on Long Island) regarding the Mid Island Plaza. It triggered a lot of memories which led me to search out this site. I grew-up right behind Sears on Bay Ave. My brother and sister remember Sears as a potato farm and then and abandoned field which they played in. I was to young to remember that. We lived so close we usually walked to the plaza unless the car was required for heavy shopping. I too have the same fond memories shared by others on this site. I vaguely remember sought of a farm/petting zoo/amusement park outside the plaza. It had a large tree in the middle and small kiddie rides around it. Don’t know if it was a periodic carnival or permanent setup. Please tell me someone else remembers this so I know I’ve not completely lost it. LOL! @Kenny Rohan, I don’t know about the farm, but I remember a semi-permanent but tiny amusement park (about three rides, all of them small: carousel, ferris wheel, and a train or car ride). It was in front of the Twin movie theaters (where Ikea is now). I think it ran only in the warm months. Like a groundhog that died during its hibernation, one spring it just didn’t revive. I think it ran for a couple of years, though. @Bill, …and yes, I remember the big, weird tree. It was sort of like the rides kind of grew up and around it. I think the merry go round actually had a brass ring you could try to grab. I was very little and was terrified to reach out for it, but the big kids could. Wasn’t there a white fence around the whole area? @Bill, I remember that amusement park….It did have a white fence. @Karen, OMG, Louie from Electronic City!!! I’d forgotten him! After they left the mall, he was still at the New Hyde Park location into the mid-to-late ’80’s. @Karen, Friendly Frost?!? Unless we’re talking W-A-A-A-Y back in the early days of the mall before my family moved to Hicksville (early 1960’s), I distinctly remember FF being in Westbury. Go on Old Country Road heading West. Go over Wantagh Parkway and make the first right onto Frost Street. FF was all the way at the end. I don’t know what’s there now other than Toyota Service. Those were the daze!! Bus 35c to the mall!! When we got off we would SKITCH on the busses going down into the TUNNEL! for those of you who dont know what skitching is- a dangerous joy ride of holding on to the back of a vehichle and using your CHUKKA BOOTS as skiis! CRAZY! then we would hang at the mall all day EAT Pizza DAMORE which was absolutly the best! then Im sure it was GERTZ that had that ice cream thing in the tall glass with a long spoon! wheres that innocence today GONE! I think you were talking about Lollypop farm. It was on Jerico turnpike. I remember the Sicilian Pizza at the Bus Station in Hempstead. There was a time long ago the Pizza and a cold draught beer in the bar at The Coldstream was pretty darned good! I’m surprised nobody mentioned the car wash that used to be at the extreme northeast corner of the parking lot. For a while, it was a ritual for my dad to bring the car every Saturday morning, naturally I’d tag along. After being closed for a long time, the car wash became a Bagel Nosh in the 1970’s. Then it became Boston Market (which I think it still is). Speaking of businesses in the mall that technically weren’t “in” the mall, I recall the Nathan’s that’s roughly where On The Border is now. The corn on the cob was good. I could never understand why people raved over Nathan’s french fries, though. Whenever I had them, they were from the Hicksville store, and they were downright foul! I think they never changed the oil in the fryvats, they only kept topping it up. I also heard that they were a good “stepping-stone” for summer work in that they’d hire anybody…no experience needed. The work was probably godawful, but at least you could find better summer/afterschool employment once you had some experience under your belt. But I’m confused. Everyone seems to refer to this sundae/parfait as containing frozen “custard.” To a lifelong LIer like me, custard is an eggy pudding that is normally found inside Boston Cream donuts and Napoleons, but never in cones or parfaits. NJ folks (et al) call soft ice cream (like Carvel and DQ) “custard.” So which was it: egg pudding or soft ice cream? I enjoyed many of the frozen desserts back in the late 1950’s. I have read most of the posts here about what it was like. It was not ice cream, it had no malt in it, it was not like Carvel, it is not a pudding. One time a saw the blond haired lady adding more of the mix to the machine that made it. She put several half gallon containers of a premixed milk based product into the machine and turned it on. I have found anything like it in the last 50 years. You can not make it yourself. I have tried to recall or read about what the true name of the dessert was called originally, but have not heard the right name. If anyone recalls what Gertz called that dessert, please post it here! @Rich Dunlap, Since I worked at Gertz for a couple of years, I had many of those “sundaes.” For the life of me I can’t remember what they were called. The counter was on the first floor toward the back “mall entrance side.” I worked from 1973-75 and I believe the lady who ran it was named “Jackie.” She might have been the same person you remember, as it was such a family there, that many employees stayed on for 30 years and more. It was not like Carvel, or custard, and seemed somewhat artificial … you sort of had a feeling it wouldn’t melt without a welding torch! LOL! Served in a tall thin class, with the long handled “ice tea spoon.” She would squirt chocolate syrup down the side of the glass, turning it so it looked like a parfait. On another site, someone said the ice cream was called “Frostee Malts.” On this site, someone called them “walk away sundaes.” I never had this treat & would love to try it if anyone knows of a similar treat. Many people have good memories! I worked at Gertz from April 1973- November 1975. Back then, Gertz used all 5 floors, for selling, with the fifth holding toys, sporting goods, cameras, records, books, stationery and housewares. The 4th floor was human resources, the cash office and furniture, 3rd, china, childrens cloths, layette and linens, 2nd womens fashions, and the first mens and women’s assorted departments, shoes, and cosmetics. Of course there was the basement store and Long Island restaurant. Yes indeed, E J Korvettes took over the spot where S Klein was, and where Ikea is was originally the movie theater. Gertz was the flagship, and when it was built secured a lease for something like $1 a year for 99 years as the main draw to the mall. The upper level was added at one of the wings in the 90s, when the movie theater was located upstairs along with the food court. Gertz also had two outside buildings. One near the store which over the years served as furniture outlet, garden shop, and various other departments, and further out in the parking lot a tire and auto repair center. Besides the normal chain stores of the time, like Newberry’s, several shoe stores, a luncheonette and Chinese restaurant, it had several small mom and pop stores. I don’t think that ice cream served at the snack bar in Gertz was a malt. It was some kind of whipped ice cream or custard. Thanks for all these memories guys. As a youngster I went to Mid Island all the time with my Gran and Mom. Standouts for me were like, Nuberrys, Hurdy Gurdy. Brings back so many good memories of the 80’s and early 90’s. Fond memories about the Gertz parfaits. I remember a shelf that went around the wall by the “ice cream” area where people would leave their empty glasses. Also, this dessert made me thirsty. Do you remember the water fountain that was there? Awesome. Can’t believe it’s been almost 37 years. I grew up in Hicksville and still shop at the Broadway Mall. I have fond memories of Mis Island Plaza, which was adjacent to my elementary school. Where Target now stands was Food Fair and Shop Rite. Then Pathmark. There was a great Pizza place’ Pizza D’Amour a Chinese restaurant’ Longs. And a Kosher deli. The electronic store was Lectronic City. there was a Newberrys and a Kresgese and a lot of shoe stores. kliegs came in in 1969 and later became Korvettes. There was an upscale women’s clothing store near Gertz called Casual Corner. Gertz had a snack bar near the mens department entrances that sold soft ice cream with syrup for ten or fifteen cents. Broadway Mall despite it’s size & location 7.5 miles from the enormous Roosevelt field, has been able to atract most of the mid-range stores & keep vacancies to a number that can be counted on one hand. They were able to atract Buffalo Wild Wings & Panera Bread wich is somewhat impressive considering that there are better sites along Old Country Road. There just happens to be one in Carl Place 1.7 miles from here on the formentioned OCR. As a footnote on Roosevelt Field, a new wing featuring Nassau Counties first Neiman Marcus is scheduled to open in 2015. It will be constructed ajacent to Macy’s, Bose & Disney. Currently Au Bon Pain, Sir La’ Table, Lush, Havana Central &The Capitol Grill are currently under construction while Skinny Pizza recently opened. There’s alsa a Tesla dealership opening in November. @SEAN, I was refering to Panera in the middle of my last post. The extensive use of windows & skylights give the mall an airie feel. Roosevelt Field prior to the renovations in 1996 on the other hand, felt enclosed & constricting despite the malls enormus footprint. After this renovation things were much improved except for two things… first when crowded thee noise level gives the sence of being inside of a drum with all the hard surfaces & second, the food court layout in the shape of a blimp is overwelming to navagate when also crowded. I do like the concept however since it reflects the idea of flight & this was an airfield originally. I loved working at CONSUMERS…It was always busy. I remember my manager was a tough young woman who like a football coach whipped the staff into condition. I worked both the stock room and jewelry and during my last years a really great manager…John took over. Great fun..especially using fake names over the intercom! Consumers became the present day …Amazon! No conversation about Mid Island will ever be complete without talking about the Sunflower Shop, the first store on your right when you entered the mall from the East main entrance. In the back of the store was a black light room, with black lights and black light posters. They had chairs in this room dso you could go in and sit dow. In the mid-to-late ’60s and early ’70s, when hippies were all the rage and LSD and pot (never knew why they called it pot) were available in every Long Island public high school bathroom, guys and grils who were tripping or stoned would go into that room and sit there all day until they came back down to earth. Was pretty sick when I think back on it now, but you were really cool then if you had the cajones to go sit in the Sunflower Black Light room. In the early ’70’s, I guess the store had seen its peak, there was a whole lot of pressure coming down on schools and malls and any place where kids hung out to make drugs an enemy (that’s when the “war on drugs” started), and the Sunflower shut down. Import Alley opened soon thereafter in the northern wing of the mall, and it was a really innocuous store of cheap Asian imports…but what paid their rent was that they sold pot pipes ! So every kid in the area during the mid-70’s got to know the Import Alley. Next to the Twin Movie Theaters was an outdoor type place, sold fishing and hunting and camping gear…you had to enter from the outside, there were two levels, one at street level and one down a flight of stairs…not a great business, but the owner got rich in the course of a two year period in 1971 and 72, because he had the only store in the area that sold these hideous looking drab pale green parkas with a fur-lined hood. For some reason, these parkas became a fad among Long Island teens, and this guy could not get them in fast enough to meet the herd mentality of teens. One of those strange things you remember from your youth…like the streaking fad in 1973-1975. The woman who was the head of mall security, always dressed up like a Canadian mounted police person, her jet-black hair looked like it was cut by putting a bowl over her head and cutting around it. Spent some of the best years of her life chasing kids out of the mall on Saturdays…that was her contribution to the world. I think she was probably the first lesbian I ever saw, maybe the second after the elementary school gym teacher who looked like a Russian weightlifter. And then there was Deutsche Jewelers, a couple of store to the east of Gertz…they made a lot of money selling those sterling silver i.d. bracelets that guys would buy to give to girls they were going out with. The rest of the memories have been covered already…we should all contirbute this into one book written collectively, “Confessions of Mall Rats : Circa Late 1900’s”. the film didn’t show up till 1979: and predates the second (but never final) “Mod” revival of 1977-1981 or so, but that was in UK mainly. ANY Mod worth his salt would have tracked down a solid M-51 or whatever it was US reissue or orig. issue Army fishtail parka. Or something nearly of the same description and it would absolutely have had a liner and fur lined hood if it was the real deal. sell for at least $130-500. spare black metal frames and all that). Plaza. Lived in Westbury attended Burns Ave and graduated Hicksville High 1971. From the dessert at Gertz to Pizza and going next store to buy a single record at the record shop life was good Arround 1971 through 1973 worked at the movie theatre as a candy girl. Th ushers would help people to their seats and wore tuxedos. There was a guy there that I thought was so cute. Black hair blue eyes. To this day I thought it was Alec Baldwin. Age doesn’t match dates though. When I was 14 my mom would allow me to take a bus from the back of the mall to Jones Beach. That was cool. I remember when the Hicksville Mall was built. I worked there while in HS at Island Trees in the Bonds Clothing store. In 1964 I was working as a window trimmer and we had Andrews as an account. Back then it was a corner store near Gertz. Later when the mall was closed in it moved to a more central location. The owner of the store got his start selling clothing at the Farmer Market. The Hicksville store was his first one. He later opened two others one at Roosevelt Field and the other in Bayshore. Born 1957, grew up in Syosset, now I live in Hicksville. this brings a lot of memories. I remember Newberrys. I especially remember the giant star. Does anyone know where there are old photos I can show my kids? I remember a slot car racing club in a basement. I think that building was demolished(?). When I was a kid we used to take the LIRR to the mall. Syosset still does not have buses! I also remember a tool store by where IKEA is. That was in the 80’s. @Alison, That tool store was called U.S. General Tools. Here is a picture, referenced above, with a time in the mid 70’s with a plane in front. My grandmother took me to the Gertz in Queens for the frozen custard with the chocolate syrup a few times and my mother took me to the Gertz in the Mid Island Shopping Center in Hicksville many times in the 1960s. For those of you who never had the pleasure of having this delicious frozen dessert, it was not a drink and it was nothing like an egg cream. I remember it as being vanilla flavored very soft custardlike ice cream. I do remember that they washed the tall glasses right there and I do remember the glasses being warm a lot of times. I only tried the strawberry sauce once and the other 25 or so times I had this dessert, I had it with the chocolate sauce. It wasn’t like hard ice cream and it wasn’t like carvel. It wasn’t like frozen yoghurt either. I think it was a very fluffy frozen curstard that had a lot of air in it. I had this dessert for the first tim when I was about 4 or 5 years old and I believe I had it for the last time when I was about 8, 9 or 10 years old. I wonder if I had it today, would I enjoy it as much as I did when I was a young child. Sometimes things aren’t as good as you think it was. My favorite moment was when they handed me my Gertz frozen custard. And I hated it when I was finished with it and there was nothing left in my tall glass. If I close my eyes and think really hard, I can sort of remember the taste, the texture of the Gertz frozen custard. It was sort of like Dairy Queen but more custardy and fluffier. @Rick Levenberg, I can remember the taste, too. The recipe must be somewhere. It couldn’t have just disappeared from the face of the earth. Even if it was premanufactured like someone above suggested there’s got to be a trail somewhere. I didn’t really like going shopping with my mom all the time but if she was going to Gertz, I always wanted to go – just for that custard. I was 10 more or less. On a recent trip to several malls on LI, I noticed that the outside of the Macy’s location at Broadway Mall was shrouded under construction tarps. It appears the building is being refaced to give it an updated look. Despite it’s smallish size, nearly all the mid-tier national tennents are represented & the vacancy rate is extremely low. Most of the stores here can also be found at Green Acres it’s onetime cousin as Vornado sold Green Acres to Macerich along with Kings Plaza for $1.25 Billion. Chances are that Vornado will sell the rest of their retail assets to raise capital. KKR & Co. (KKR), the private-equity firm that raised $1.5 billion for its first real estate fund in December, and its partners bought a suburban New York shopping mall from Vornado Realty Trust (VNO) for $94 million. The 1.14 million-square-foot (105,600-square-meter) Broadway Mall in Hicksville, Long Island, was sold to an investor group including KKR, Cushman & Wakefield Inc. said in a statement today. KKR teamed with Broadway Mall Pacific, a partnership of Pacific Retail Capital Parters, Clifton Realty and Peter Fair of Continuum Partners, for the purchase, said the brokerage, which represented New York-based Vornado. The real estate investment trust said on Feb. 14 it agreed to sell the mall. It didn’t identify the buyer. “This was a rare Long Island mall offering, and with its great demographics it attracted considerable interest,” Andrew Merin, a Cushman broker, said in today’s statement. Almost 20 prospective buyers toured the property, “an indication of the fact that retail continues to be a strong performer in the heavily populated tri-state area” of New York, New Jersey and Connecticut. KKR and TPG Capital are among U.S. private-equity firms expanding in property investments to diversify beyond corporate buyouts. Within retail, KKR has bought three regional malls, including Broadway Mall, and one outlet center since it formed a real estate unit in 2011. 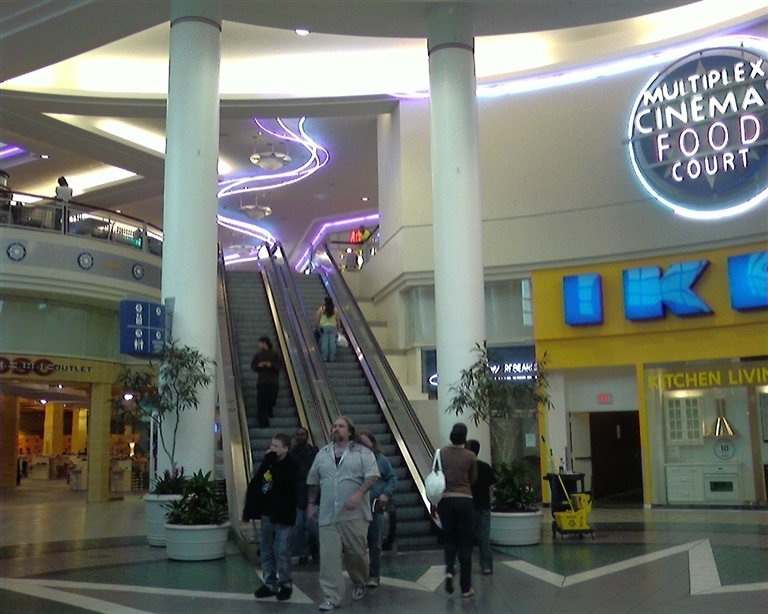 The New York-based firm said in April 2013 that it was part of an investor group that bought the Colonie Center shopping mall in Albany, New York, teaming with the same partners it had for its first retail deal in April 2012, the $196 million acquisition of Yorktown Center in the Chicago suburb of Lombard. KKR also entered the outlet-center business last year by winning a January 2013 foreclosure auction for Legends Outlets Kansas City. The purchase price was $131.5 million. 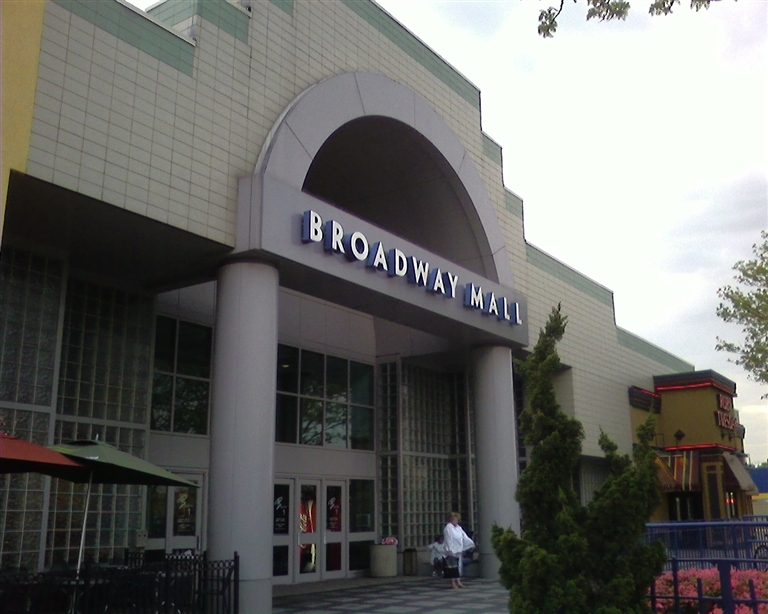 Broadway Mall was built in 1956 as an open-air center, enclosed in 1972 and renovated in 1991, according to Cushman. It is more than 90 percent occupied and anchored by Ikea, Macy’s and Target stores, the brokerage said. “With a targeted capital improvement program and a revamped leasing strategy, Broadway will be a more attractive home for current and prospective retailers,” Ralph Rosenberg, KKR’s global head of real estate, said in a statement today. The mall generated about $300 million of retail sales in 2013, according to KKR. Broadway Mall is KKR’s 15th real estate fund investment since 2011, according to the statement. Before raising a fund, KKR used mostly its own cash and money from its credit division, KKR Financial Holdings LLC. The credit unit also invested in Broadway Mall, KKR said. lived in Levittown (moved out in 1988). cream shop across from Waldenbooks. (a version of which may still exist). set there around 1980 or so. Too cool! I don’t know if anyone gave the name yet-I haven’t read the entire thread, but that delicious frozen confection was called a “Frostee Malt” My father would take me to Gertz and it was the best ice cream I ever had! Lived in Hicksville until 1982. During the late 60s and the 70s, I’m surprised nobody has commented about three other stores I remember specifically. One was a craft store, Loki Crafts, where I bought many of my plastic car models and the other was Cherry Hill bookstore. If I remember correctly both of them were on the same side where the Longs Chinese restaurant used to be. The third store was a RadioShack located on the backside of the mall which was only accessible through its own entrance from the parking lot and not from a mall entrance. I remember working at the Bonds clothing store one summer before college. Used all my commissions to pay for my college wardrobe next year. That was great. Right outside of Bonds there was a kiosk type restaurant/food stand that sold the best potato knishes. When people mention Electronic City, all I need to do is look over to the stereo cassette boombox I bought there and I still have. Damn thing still works. I do have a vague recollection of Louie. One post was about the popcorn smell and Newberries. I can still remember that smell. They had one of the best toy departments so you had to pass the smell in order to get to the toys. I believe the toy department was downstairs. Hicksville sure has changed. The one post that mentioned that it was much safer for children back then sure hit the nail on the head. Going to Mid Island Plaza was an event, something to be looked forward to. There was another post that mentioned that back then each mall had its own personality. That is so true. Lucky for all the people posting here we can relive good memories in both text and pictures.